After my 25 mile recovery ride on my Fixed Gear I went for a run. 1.5 hours nice easy pace. It turned out to be 9 miles. I’ll need to adjust my heart rate in the “sport specific zones”. As I view this graph it shows I was in “hard intensity” zone. I didn’t feel that at all. I don’t have much faith in Heart Rate training anyway since I use a power meter on the bike. 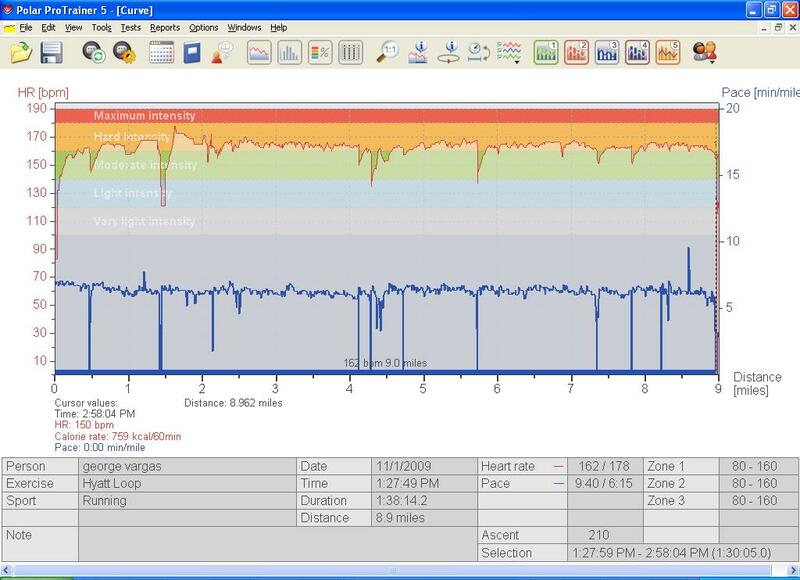 I will adjust my max Heart Rate so that my perceived effort coincides with what the software thinks is a hard effort. This entry was posted in Fixed Gear, running by REV Cycling Directeur Sportif. Bookmark the permalink.